For me the key has been *being* success Jonathan. Not judging moments, not seeing wins or losses, not seeing failure or struggles, just being a servant, honing my skills, helping, promoting others and giving little attention to outcomes. Just falling in love with the process. "Fear is the path to the dark side. Fear leads to anger. Anger leads to hate. Hate leads to suffering. Yep, afraid l am, l have Andrew Carnegie, and other great industrialists on a DVD set, and Andrew actually sunk an oil well, almost went broke, then after missing a train, that went over a cliff, (the bridge was out) had it go to his head, (he was pretty religious) and made a deal with another rich industrialist, (can't think of his name, but he was much richer) and yeah, up he went in power. It is people like this that did open up the US, with train lines and such, but also put the dollar above all else, which explains the world we live in now, where parts of illness, energy and space exploration are suppressed and buried to make a buck and maintain stability. And true that Henry Ford, did bring in mass production, but he also made his workers slave away in order to maintain bonus payouts. When the world religion revolves around economic growth as the God every nation must serve ..
when there is more money to be made putting someone in prison for a small amount of drugs .. than off what that person would pay in taxes if they where working ..
or more money to be made if people eat processed food or fast food then treat the diseases they get from bad diets ..than if you taught the to cook and shop ..
ok let me use US figures on this ..say it take 200,000 USD to educate a child from k-12 ..yet after 13 years and the time money and effort of everyone involved you get the product has no marketable skills ..
you go into a hospital in the US an asprin that cost 1 cent.. you get charged like 20 dollars .. an Iv bag costs a few dollars ..you get charged 130 dollars or more . when healthcare is near 20 percent of the gdp .. and as a country you spend 2.5 times more per person than other rich countries ..you can only justify this.. if bringing the cost down to the rest of the modern world average ..can not be justified because it would mean at least a 10 percent shrinkage of gdp ..
Fortunatly there is a revolution going on and a Brutal fight most people dont know is going on ..
but Like in star wars .. on alderan.. most of the planet had no idea there was a rebellion going on ..until their planet got blown up and they got informed in the after life .. The prequel Yoda one liners went to Ja Ja, and the world daydreamed about him getting his tongue caught in an industrial machine with nasty sharp bits. But true the prequel Yoda went from realistic puppet to CGI, animated, 20 cans of red bull, light sabre, frenzy at will. Or crap, but at least Darth was legless at the end, lol. When l sink an oil well, and read Think and Grow, l will let you know! He empowered himself by making sure 5%+ of the modern world are descendants of Genghis Khan. His grandson was about to pwn Europe but got recalled to attend a funeral. Every time I see that Yoda phrase posted - I wonder whether the script writer who came up with it gets a chuckle when he sees it. choose the victory as your only option. Luke "I don'r believe it!" Yoda "That is why you fail"
Yoda "You will be. 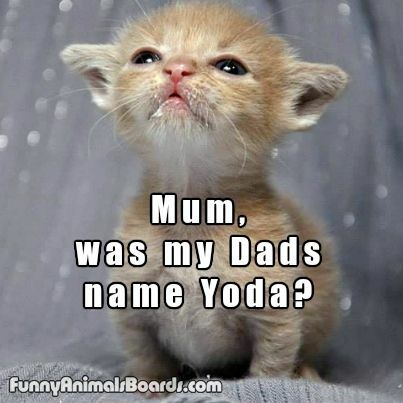 You will be"
Yoda "No. Do or do not. There is no try". I really like the last one. If you are trying...you have already accepted that you will fail, and you almost certainly will. And you'll fail because you'll hold back, and not give a maximal effort. "I'll figure it out" or "I'll work it out" are things you say (or think) when you are really going to follow through. One thought I like to share is "perhaps I'm stronger than I think". For some reason, that holds great power with me.